You know you can take this in stride. Know that your intentions should be clear in order to get to where you want to be. In this case, the chameleon symbolism is letting you know that the activation of a new awareness of your psychic ability and intuition is here. Therefore, you must take the time to allow yourself to explore these new abilities and learn how to use and trust them. Conversely, chameleon meaning can also be bringing you news of changing environments. In other words, old tensions and frustrations can now be lifted and healed. Correspondingly, it may also mean a move to a new department at work. Chameleon symbolism may also be reminding you that the world and people around you will only perceive what you put out for others to see and believe. Explicitly, you must now take the time to analyze what you are projecting so that you can adjust accordingly. Alternatively, this little creature may be letting you know that it is time to change your loyalties. The color that you are wearing is getting a bit thin. Therefore it is essential to make the changes that you need to and explore new truths for yourself. In other words, you are more than just a suit that repeats what everyone else has to say. Moreover, chameleon symbolism reminds you to take the time to analyze and think for yourself. In general, people with the chameleon totem power animal are incredibly adaptable to all situations and surroundings. They know when to strike and are a master in combining patience with intuition. These people are also susceptible to the energy of others and often can use this to their advantage in business. They know a great bluff when you see one. Folks with the chameleon totem also tend to focus a little too much on the past or the future, especially when they should be grounding themselves in the present. 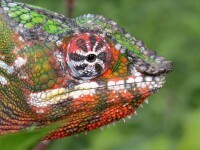 For the most part, a chameleon dream represents your ability to adapt to any situation. Consequently, the vision is letting you know that you are versatile and are well-rounded. Alternatively, this creature in your dream is symbolic of your need to be noticed. If this reptile is red, then you are not asserting yourself enough to attain your goals. A blue one symbolizes the need to express yourself to those above you. In other words, let them know that you are interested in that new job opening. 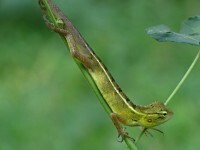 When you see a yellow one of these reptiles in your vision, you will soon need to draw deep for your courage. In fact, you may have to face one of your deepest fears shortly. If this creature is continuously changing color, it can be a symptom of having to make up your mind. Therefore you must pick a direction and stick with it. Alternatively, a chameleon dream can also mean that you have reached your goals along with the rewards that come with it. However, this is no time to rest because along with these rewards, come more responsibilities. I saw brown hourse in my dream eating fresh grass ,what does it mean.